Ralph Lee Minter was born on June 27, 1921 in Pine Forest, Texas. He was one of seven children born to Emmett Bascom Minter (b. 1882 - d. 1945) and Ruby (Bryarly) Minter (b. 1888 - d. 1929). There were four girls and three boys in the family, with one sibling, a girl, younger than Ralph.. Ralph's father, Emmett is the son of Sylvanus Oliver Minter (b. 1854 - d. 1906). Sylvanus Oliver was known as "Uncle Syl," and was a farmer, as well as a bricklayer. Sylvanus is one of the Minter party that migrated to Texas from Georgia in 1855. As a boy, Ralph first attended school in the school house in Pine Forest that was built in 1912 and demolished in 1989. Later, when he got to the upper grades, Ralph went to high school at Pickton, Texas, from which he graduated. Pickton is south of Pine Forest, Texas, 6.3 miles. 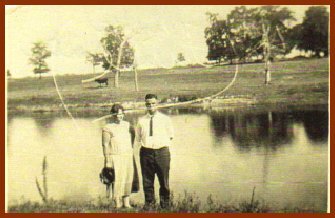 a mile east of Pine Forest on what is now County Road 3372.
away with his fishing gear and spend an afternoon at the pool. casting for a fish. He told Ralph that the fish couldn't resist that bait. piano, and spent lots of leisure hours pounding out tunes on it. After his maternal grandfather died, Ralph was given the old man's fiddle, which he also learned to play. These musical abilities made him popular at local gatherings. In 1942 Ralph joined the Army Air Corps (now known as the Airforce).. After Basic Training, he was assigned to an Air Traffic Control Unit, and worked in a Control Tower. All that time Ralph was trying everything he knew to get an appointment as an Aviation Cadet, and to get sent to receive flight training. he applied for a position as a cadet , and progressed as far as classification, where he received a comprehensive physical examination. He was rejected on physical grounds for pilot training because of an old elbow injury. Shouldering that disappointment, he applied for air crew gunnery training. To which he was accepted after signing a physical waiver for exceeding the height regulations allowed. Ralph trained in aerial Gunnery at Duncan Field in San Antonio, Texas.. Following that he was sent to England, and was assigned to and served with the 8th Air Force in Europe. During the war (World War II), he served as a tail gunner in combat. After the war, Ralph was awared the Presidential Unit Citation, the Air Medal, and the European Theater Operations (ETO) Service Medal with battle stars. Ralph's mother Ruby died at the relatively young age of 51 years. His father Emmett was tragically murdered in 1945 across the street from the Hopkin's County Courthouse in Sulphur Springs, Texas. The murderer was tried and convicted in that same courthouse, and sent to prison. In 1945, Ralph married Jaynelle "Jay" Adwon in Austin, Texas. Jay was from Wetumka, Oklahoma, and like Ralph she became a teacher, and taught the elementary grades. Jay had a son, Robert "Bob" Minter (b. 1943), by a previous marriage, which Ralph adopted. Ralph and Jay together adopted a girl, Cynthia Maureen "Cindy" Minter (b.1949). After the war, Ralph used the benefits of the "G.I Bill" and went back to school. He graduated with a bachelor's degree from Southern Methodist University.in Dallas, Texas. He subsequently did graduate work at Oklahoma State University, and later took courses at Wichita State University in Kansas. After leaving college, he joined the education profession as a teacher. He taught science in the Mc Alester, Oklahoma, schools. Later he took a position as a school counselor in the Wichita, Kansas, school system. In 1980 Ralph took early retirement from the education profession in order to join his wife in a business of buying and selling antique dolls and toys. Together Ralph and Jay travelled all over the country attending Antique Shows, where they bought and sold their line of products. That was a way of life for them for over twenty years, and until their retirement in 2001. In June of that year they attended the Minter Family Reunion in Pickton, Texas, where you might say, Ralph made a "full circle." Ralph Minter at the Minter Reunion in Pickton, Texas, in June of 2001, which he attended with his wife.